Anyway, I can see how we can all add interesting as a friend and get updates that way, but how do we do that thing they did at macworld where anyone could precede their tweet with 'macworld' and everyone subscribed would get that? Is that something twitter need to set up or am I just being dense? That's more than possible. I just spent an hour installing new printer drivers when the damn thing just wasn't plugged in. 1) Creating an 'interesting' rss feed using Yahoo Pipes. Basically you send the twitter public timeline feed to a Pipe, the pipe looks for the word 'interesting' as the first word of the tweet, collects them into a new rss feed, ignoring the rest. Clone/copy the pipe for yourself or just use the demo rss feed as is, or send it to a new feedburner feed for neatness. 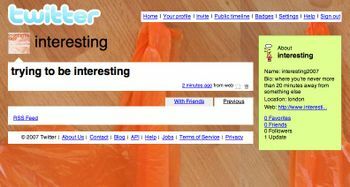 2) Sending the 'interesting' rss feed into the twitter/interesting account. That solution isn't entirely satisfactory. Working on it with Mr Zero on twitter. Anyone else care to chip in?